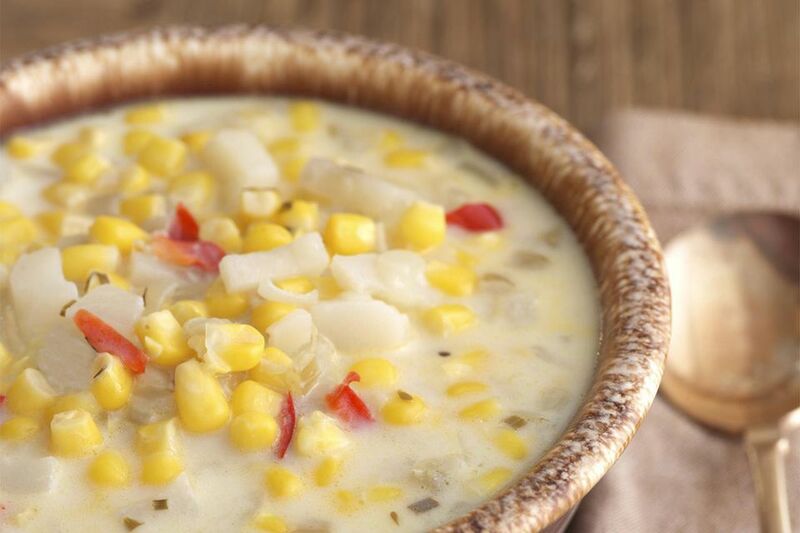 This classic corn and crab chowder will warm you through and through, even on the bitterest of winter days. The sweetness of the corn and crab combined with the saltiness of the bacon or salt pork create something truly magical. Additionally, the red-skinned potatoes bring a great element of color. It's not always easy to get fresh corn year-round, and frozen corn is perfectly fine. The starch from fresh corn, though, will have slightly better thickening properties than frozen. But most importantly, one thing you can't do with frozen corn that you can do with fresh corn is to grill it. The way the kernels get so beautifully charred and caramelized adds all kinds of complex flavors. Just grill the corn, let it cool, then slice the kernels off the cob and add to the soup as described below. Cut the salt pork or bacon into about ¼-inch cubes. If using bacon, this may be easier if you let the bacon sit in the freezer for a few minutes before dicing it. Add the pork or bacon to a heavy-bottomed saucepot or soup pot, and heat it slowly over a low heat, stirring more or less constantly, for 3 to 4 minutes or until the fat is liquefied. Be careful not to let the fat burn. Lower the heat if it starts to smoke. Add the chopped onion and cook it over a medium heat until it's translucent but not brown, another 4 minutes or so. Add the flour and stir with a wooden spoon while it's absorbed into the bacon fat, making a roux. Cook the roux for another 3 to 4 minutes, but like the onions, don't let it brown. Slowly whisk in the stock, making sure the roux is fully incorporated into the liquid. Keep stirring while the mixture comes to a boil, and then add the wine. Add the potatoes and simmer 15 minutes or so, or until you can easily pierce the potatoes with a knife. While you're waiting for the potatoes to cook, heat the half and half in a small saucepan. You want it hot (but not boiling) so that when you add it to the soup in the next step, it won't cool down the chowder. Add the corn and bring the chowder back to a simmer for just a moment. Then add the crab and stir in the hot half and half. Season to taste with Kosher salt and white pepper, and serve right away.